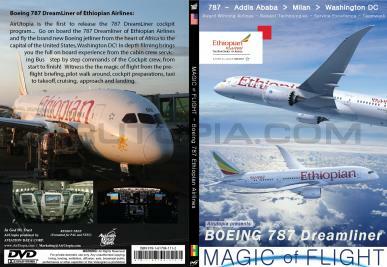 AirUtopia is the first to release an in-flight program of the Boeing 787 Dreamliner with the 'Spirit of Africa' - Ethiopian Airlines! Go on board the 787 Dreamliner of Ethiopian Airlines and fly this brand new Boeing jetliner from the heart of Africa to the capital of the United States, Washington DC! In depth filming brings you the full on board experience, from the cabin crew servicing Business Class and Economy Class to the step by step commands of the cockpit crew, from start to finish! Witness the magic of flight from the pre-flight briefing, pilot walk-around, cockpit preparations, taxi, takeoff, cruise, approach and landing. Learn about Ethiopian Airlines future plans for fleet expansion and vision from an introduction by the CEO.... welcome to the Spirit of Africa!